Reading other peoples blogs is something that I love to do, I find a lot of my inspiration from fellow bloggers and today I thought I’d share with you 10 lovely bloggers who I am currently obsessing over. I get emails on a daily bases from Bloglovin’ with recent updates from a few of my favourites and I spend the good part of my mornings in bed reading through their latest posts. 1- In The Frow // I have mentioned the lovely lady that is Victoria here on WLL a fair few times now but she is just one of my favourite bloggers that I adore. I love catching up on Victoria’s posts, her photography is just stunning, her blog mainly focuses on fashion and style but she also posts about beauty, travel and lifestyle. If you haven’t already, go follow Victoria on bloglovin’ here. I can’t go a day without checking my bloglovin feed for a new In The Frow post. Love her. You can also follow Victoria on her Instagram // Twitter // Facebook // Youtube. 2. Vivianna Does Makeup // I have also mentioned Anna before on WLL but her blog just draws me in and I can’t go a day without checking her recent posts. Anna is so lovely and I got the pleasure of meeting her at #BeautyChatLive. Her blog is focused on beauty but she also has the odd fitness, lifestyle and style post thrown into the mix. I just have to type in ‘V’ in my search box and her blog comes up, that how much I love checking up on a new VDM post. I would highly recommend following Anna on bloglovin’ here if you haven’t already. You can all follow Anna on her Instagram // Twitter // Facebook // Youtube. 3. Lily Pebbles // Now you can’t mention Anna without mentioning Lily, and visa versa. I also got the pleasure of meeting Lily at #BeautyChatLive in February and it was so nice to meet the person behind the stunning LilyPebbles.co.uk she was so lovely and it felt so good just to be able to chat to them about makeup and pretty much anything. Lily’s blog has recently had a makeover #LPMakeover and the new design is incredible. 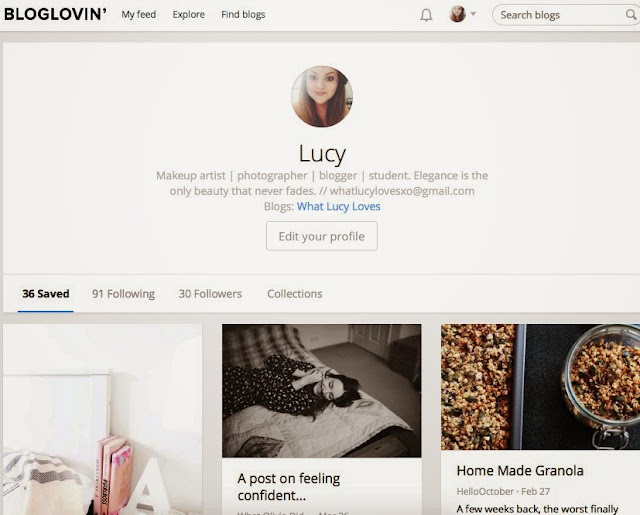 If you don’t already, go and follow Lily on bloglovin’ here. You can also follow Lily on her Instagram // Twitter // Facebook // Youtube. 4. Idle Lane // Danielle is the beautiful lady behind Idle Lane, her blog is mainly focused on Fashion, with the occasional beauty and lifestyle post thrown in. She also has a fitness youtube channel which I love to do on my days off. Danielle hasn’t had her blog for long but she has taken the blogging world by storm, I love Idle Lane for style inspiration, fashion tips and wish lists. If you haven’t already, you can follow Danielle on bloglovin’ here. You can also follow Danielle on her Instagram // Twitter // Youtube. 5. Hello October// Suzie has been one of my favourite bloggers for a while now and I adore her style. Her blog focus on beauty and style, she has gorgeous photography and I love it when she updates her blog. I also have Suzie on Snapchat and I love to see what she gets up to on a daily bases, her little doggy Nala is also a little cutie. You can follow Suzie on bloglovin here. You can also follow Suzie on her Instagram // Twitter // Youtube. 6. This Fashion Is Mine// Gwen is a photographer and blogger, she has her own photography studio an she also posts photography and blogging tips. When I was first starting out with blogging, I used to read Gwen’s Tips on photography and blogging all the time, they’re great. If you haven’t already, go and follow Gwen on bloglovin’ here. You can also follow Gwen on her Instagram // Twitter // Youtube. 7. Porcelain Beauty // I’ve been following Heather on Instagram for a while now and I have always adored her photographs and feed. Her blog is new to me and I have only just started to read it. She has a beautiful style of writing, I’m looking forward to reading her blog and seeing what she reviews next. You can follow Heather on bloglovin’ here. You can also follow Heather on her Instagram // Twitter // Facebook. And of course, you can follow my blog on bloglovin’ here too. Thank you so much for featuring Porcelain Beauty within this post, i'm so honored to be included with such great company, I'm a huge fan of these girls blogs and the majority of them have inspired me at some point or another so you've definitely put a massive smile on my face!